Twelve hearty souls and a backup appeared this morning in a light mist, anxious to bowl in this year’s Mixed Draw Triples tournament. A few familiar faces were missing, but the cast of characters was replete with good bowlers. The format this year was a round-robin with each team playing each other team. The winner was determined by either game points or, in the event of a tie, by the outcome of the match between the teams in the tie. That, for the record, is how it turned out; the team led by Skip Phil Grattan was victorious having beaten the team led by skip Dave Rockhold 9-7 in a tight game decided on the final bowl of the match. Another stellar day of bowling at BLBC! Fourteen bowlers showed up all bright-eyed and bushy-tailed on Saturday for the annual in-house singles tournament. This year’s format was fairly simple, everyone bowled three games to 15 points. When the dust settled, four bowlers had accumulated the best record for the day. Ann Gardiner, Shawn Roney, Howard Mackey, and Jim Corr, were ‘in it to win it’. The four decided to finish their semi final matches on the same day even though they had to option of scheduling it another day. I suppose busy lives trumped feeling tired from a long day of bowls. After the two semi final 18-point matches, Jim Corr and Shawn Roney advanced to the 21 point final game which was played on May 22nd. The game lasted nearly two hours. Jim Corr was off to a slow start, but steadily gained on Shawn. In the 27th end with the sun just about to set, Jim scored the winning point; 21 to 18 being the final score. Congratulations to everyone who participated in the tournament. What a fantastic day for the Berkeley Jamboree! 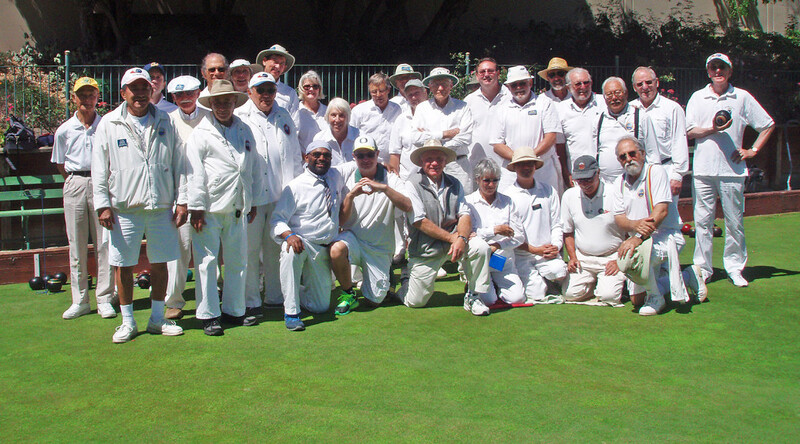 Bowlers came to Berkeley last Saturday from lawn bowling clubs all over the bay area plus a sizable contingent from Leisure Town LBC. The Jamboree was organized by Howard Mackey with help from Susan Jamart, Cathy Dinnean, and Ann Gardiner. This is a unique tournament in that every attempt is made to see that each player plays with different team mates for each game. Cash prizes are given to the individual bowler with the greatest number of points. This year, a lead from Leisure Town, Johanna Smith, took top honors. Everyone is a winner at the Jamboree – good bowling, lots of fun, and ice cream for everyone. Berkeley LBC would like to thank those who attended. We would also like to extend a special note of thanks to Cris Benton who took a special series of aerial photographs from a 35 foot carbon fiber pole. The series offers a special view of the event. Please check out Cris’ slide show or Flicker set. Cris is a brand new member of BLBC who is taking to the game like a duck to water. Welcome, Cris, and thank you for the wonderful pictures. Berkeley retains the Meat Axe – year two! When yours truly looked up and saw the lineup Palo Alto brought to the party on Sunday, I knew it would be a real contest. I mean, these guys are good! But, we had the green in shape thanks to extra effort from the greenskeeper; it was mowed, rolled and just dry enough to play well. The morning refreshments provided by Nikki, Susan, and the Mackey’s were tasty. When Howard Mackey called us to assemble, it was still a little chilly but assemble we did. 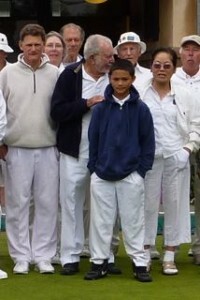 And, lawn bowling really is for all ages. In the photo below, 11 year old Matt Burnowski is with 86 year old Howard Mackey. Matt played vice for his dad, Tom. It didn’t take long for it to heat up. In the first game, I saw at least four ends with Palo Alto right on the jack and, when we returned the favor, the opposing skip sent the jack two rinks to the left to burn the end. When that game ended, my team fell short by four points. Several other Berkeley teams hadn’t fared much better. We broke for lunch well behind in the game. After lunch, the weather and our bowling perked up. By the end of the second round, we had pulled into the lead. Only five games remained to be played. As that last game was about two thirds done, someone came up to say that it wasn’t going well and I really needed to pull out a win. 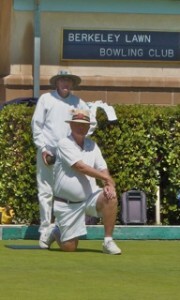 Good Grief- I’m bowling against Bud Birkenseer! No pressure. Well, we managed to pull it off. When Bud moved the jack to take five points, we countered by drawing to the jack to take it back. When Bud and I started the game, he said, “Let’s have some fun!” I don’t think we could have had a better game; good bowling, good weather and we got to finish it all off with Drumstiks ice cream. 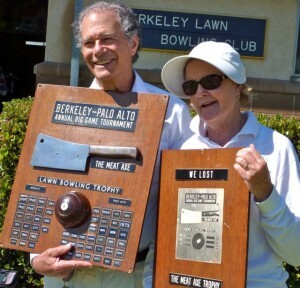 So, at the end of the day, BLBC’s Geoff Chandler held onto the Meat Axe Trophy while Palo Alto’s Ginger Harris prepared the “We Lost” version for a trip back to Palo Alto. Palo Alto will be ready for us when we travel to Palo Alto next summer. But, for now, the Meat Axe will hang in the Berkeley clubhouse for another year.